The last thing I did at E3 last week, before going to LAX and heading home, was to meet with some gentlemen from Riot Games. They greeted me warmly and offered me a seat on the sofa and some coffee, then asked: "So, what do you know about League of Legends?" "Honestly?" I blurted the first thing that came into my head: "It makes a bunch of my Twitter friends use the word 'jungle' as a verb. And that's about it." They laughed. "Well, now we know how your friends like to play." League of Legends is kind of a big deal. The basic idea is this: a player logs in and selects a Champion to play, for a 5 vs 5 match that will last roughly half an hour. During the match, the two teams each start at their own base, and must advance to capture the other team's Nexus. The field of play divides into three "lanes," filled with obstacles and turrets and minions and all manner of other things designed to kill you thoroughly. Games last roughly half an hour, which is meant to feel kind of like a "RPG microcosm." Every round, all players start at level 1 and can advance to level 18, gaining equipment and skills nearly by the minute. Start powerless, end powerful—and hopefully, want to jump in and do it all over again. As of right now, there are 99 champions from which players can choose, and Riot tries to keep each one unique and distinct from the others. Some are free (and the selection rotates); some cost real-world money. Players can buy appearance skins and so on for their favorite champions as well. I nodded along. The basics were easy enough to understand, on paper. But something about League's meteoric rise still wasn't clicking with me. The team showed me a recording of a Korean championship match, one that close to 4 million viewers had watched live. I had no idea what the announcer was saying, but he certainly was enthusiastic, and the crowd watching live in an arena was going absolutely wild. Spells were flying everywhere on screen. As best I could tell, I was watching e-sports chaos. The guys from Riot all grinned, nodding along. Clearly, this was a favorite. And other than "a PvP video game," I had no idea what I was watching. "The best way to understand it is to play it," I was cheerfully told, and I found myself being ushered to the desktop computer in the corner and creating an account. Ryan "Morello" Scott was going to be my teacher. The PR manager, Chris, introduced him as "a very loud man." There is some truth to that. But he was also a very friendly and patient man. While I was fiddling with the details of registration, Morello asked me, tentatively: "So what do you usually play, in MMOs and games like that? Magic, or..."
I always have a ready answer for that. "Rogues. Always rogue types. Sneak and stab and snipe, that's me!" "Assassin," the room universally agreed. Then they looked over what was actually available (not an Assassin), and set me up on Ashe, a frost archer. The tutorials, for what it's worth, are delightfully ridiculous. You follow the instructions of a disembodied voice, a woman's rich contralto that booms, "GOOD JOB!" when you've done something particularly tricky like, say, moving. Or clicking a button. I felt embarrassed to be receiving such virtual adulation for performing utterly basic tasks. But then I completed the first tutorial and advanced to the second, which takes the form of a standard match only populated entirely by bots. By then, I was wishing for more praise. Or really, wishing to deserve it. My hands, trained by many an RPG, FPS, and MMO, kept wandering back to WASD even though I needed QWER to cast. I was moving too slowly, not paying enough attention to everything around me. I learned to focus on offense, but forgot defense; then, got switched. After a while, I thought maybe I was starting to get the hang of it. Just maybe. "You really are a rogue," Morello mused. I hadn't realized it, but he pointed out that I was automatically trying to flank every turret and shoot it from behind. "I don't think we have a hit from behind bonus," a voice behind me pointed out. "We could," another responded. I played for about forty minutes total, all in tutorial modes. That's not nearly enough time to become an expert, or even to become competently fluent. And although I was making progress across the field in my bot fight, I had to let it go after taking out a half-dozen turrets. Our appointment time was over; I would not be able to get Ashe to the other team's Nexus. At least, not that day. 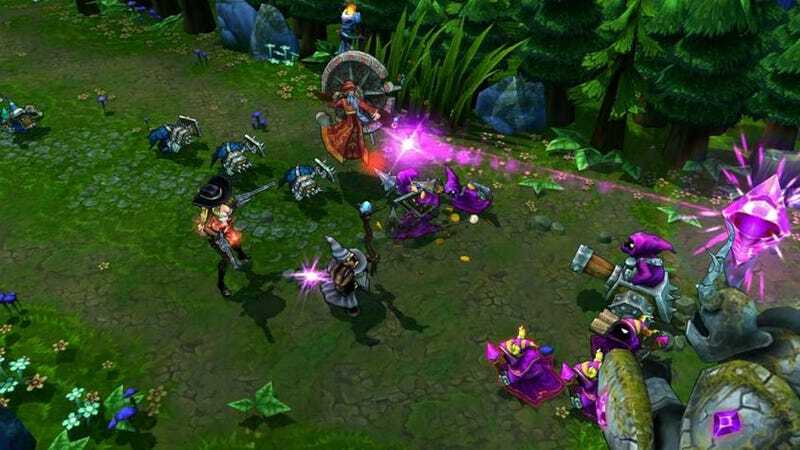 One thing became immediately clear: for all that League of Legends has an extremely competitive and often crass fan base, these guys really want everyone to be able at least to try their game. The bot-game tutorials weren't an original part of it, but added along the way, to let players (like me) work up to the challenge of playing with other people. It seems intimidating from the outside—a world with its own highly specialized language, where everyone's waiting to yell at you—but from the inside, Riot's working hard to make it approachable. I get it, now. I can see why so many fans would keep coming back, and why they'd enjoy watching skilled teams work together on the field to take each other out. There's always something going on, and some new trick to learn. And I finally learned what "jungling" is. It is a term who like to hide in things, grab all the good stuff, and choose their attacks carefully. Making one's way through all that grass without being seen? Sounds like the right challenge for me.